Lenworth Dock Levelers help to ensure a smooth and safe loading and unloading process at your facility. Lenworth takes pride in carrying high-quality dock leveler products. We’re proud to offer sales, service, maintenance and more on all types of loading dock levelers in Greater Toronto and the surrounding area. We provide several types of conversion kits for all types of existing loading docks as well as the installation of new loading dock levelers, construction of new concrete pits, and offering complete turn-key dock leveler installations including complete electrical connection. Our best-in-class preferred service program, platinum product line offering and commitment to quality and service have made us the leader in the Loading Dock and Industrial Overhead Door industry for more than ten years. Fill out the form below or call 1-877-769-0630 to get sales, service or more information on loading dock levelers. 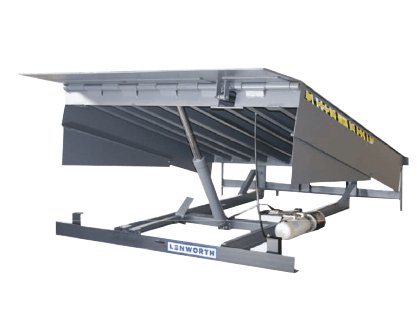 The Lenworth Hydraulic Dock Leveler features a high level of quality, ease of operation, and advanced safety features that make it an ideal choice for increased safety and productivity in your loading bay. With a single push button control for sequenced deck and lip operation, the hydraulic leveler provides quick and easy operation. When it comes to structural integrity and durability, it’s hard to beat. A minimum of six heavy-duty U-beam channels are welded to the underside of the deck at dynamic impact points. The continuous one-piece headboard intensifies the strength of the deck’s front structure. A single lip hinge pin enables a stronger distributed load. The Lenworth Hydraulic Dock Leveler, packed with safety and operational features, is a great choice for facilities that need to increase their productivity and operational efficiency. The Hydraulic Dock Leveler features a maintenance strut that supports the deck and lip, and facilitates under-deck maintenance and inspection. It also comes with a unique deck flex advantage, which allows the deck to flex up to 4″ (101mm) when under load to ensure full-width contact between the lip and the truck bed. Intelligent touch controls use a velocity fuse built into the cylinder of the dock leveler to limit free fall of a loaded platform in the event of a hydraulic line rupture or unscheduled truck departure. Hydraulic dock levelers are locally made in Canada and use easily accessible aftermarket parts at a fraction of the cost of other manufacturers. At Lenworth, we stand behind the quality of our products, and hydraulic dock levelers come with a 12-year structural warranty so you can be confident that you’re getting a dependable product. The Lenworth Mechanical Dock Leveler is a standard dock leveler that features a high level of structural integrity, a powerful hold-down system, and is designed with safety in mind. The Lenworth Mechanical Dock Leveler is also easy to use: simply pull the release chain and let the heavy duty main lift springs go into action. The deck rises up and the lip extends smoothly to the locked position. Then ‘walk’ the deck down to the truck bed and begin loading or unloading. 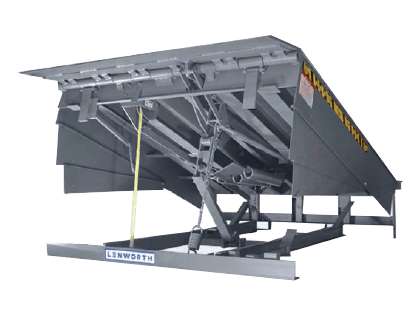 Lenworth Mechanical Dock Levelers are also very durable, with minimal moving parts, welded U-Beam channels in dynamic impact points, and a continuous one-piece headboard. With many options and upgrades available, a Lenworth Mechanical Dock Leveler is a reliable and durable solution for your loading dock area. The Mechanical Dock Leveler features a soft-pull chain that requires only 3 lbs (1.4 kg) of force to deploy the deck, and a hold-down assembly that matches dock movement with trailer suspension. The mechanical fall-safe legs also limit platform free-fall. Since we at Lenworth stand by the construction of all of our products, the leveler comes with a 12-year structural warranty, so you can buy with the confidence that you’ll receive a high-quality product. This leveler includes many upgrades, such as an “easy-float” hold down, which only requires pull force of 8 lbs, while competitive models require up to 100 lbs. It also includes upgraded gusseted lip hinge tubes for additional strength, which are typically only available on 40,000 lbs capacity units. The deck support is also upgraded to a 3-wheel support to suit 3-wheel forklifts. Traditional steel frame doors for personnel entry to your facility.